when working with Chemicals, Glassware, Heat, or Flying Particles. Require the Use of Appropriate Eye Protection — Executive Summary Word Doc. Proper Eye Protection — Executive Summary Word Doc. 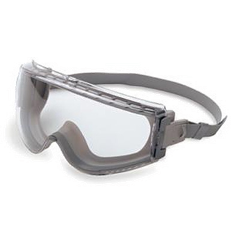 Chemical splash safety goggles should be worn when, handling chemicals or biologicals known to be hazardous to the eyes. Chemical splash safety goggles should be worn when, working with liquids which are hotter than 60°C. Safety glasses of the “impact type” (directly ventilated) are not suitable for chemical splash protection. If you can stick your finger between the device and your face, it is not a safety goggle. Kaufman, James A. Require the Use of Appropriate Eye Protection at All Times. 8October 2015. 6 June 2016 <http://www.labmanager.com/lab-health-and-safety-tips/2015/10/require-the-use-of-appropriate-eye-protection-at-all-times?fw1pk=2#.V1WUIzenUfE>. Are required in Undergraduate Teaching labs in the University of Pittsburgh Department of Chemistry (per a 2008 Memo practically since 1996). be prevented by wearing eye protection. Safety Glasses – use when in any research laboratory as a minimum level of protection. Safety Glasses are appropriate for work with flying particles, and water and salt solutions. Splash Goggles – Required in any Department of Chemistry Teaching lab. Safety Goggles should be used when working with potentially dangerous substances, and pressurized material. (see above “Safety Glasses or Goggles”). Face Shields – Are to be used along with eye protection underneath, and provide an additional level of protection guarding from splashes to the face. Face Shields should be used to prevent exposure to bio-hazardous or infectious materials, and prevent exposure to hazardous chemicals E.g., Nitric Acid (see EH&S Guideline # 04-026).